On paper Seether isn’t perhaps a band that would have you salivating at the prospect of seeing them play live. In reality it’s different; they’re tight, compact and damn impressive and make a hell of a lot of noise for a three-piece. Shaun Morgan qualifies as the scruffiest front-man alive, with his mop of unkempt hair and straggly beard and it’s a grunge look that permeates through to his voice which hints at Kurt Cobain. The music is infinitely more tuneful and structured and fits the corporate grunge category rather nicely. Morgan however can actually sing whilst churning out the guitar riffs simultaneously. Highlights include storming opener ‘Gasoline’, the hit ‘Broken’ without Amy Lee’s annoying whine and the Nirvana-light ‘Fine Again’ all enjoyed with great appreciation by the full house at the Academy. After a short tour back in November just to get the ball rolling in the UK with the new album, 3 Doors Down are once again back in the UK to give everyone the full Monty. With full stage set comprised of a drum riser decked out in the graphics of the latest album cover, a giant screen and a hidden back line this appeared to be a no expense spared show. But come on guys where were the pyrotechnics? 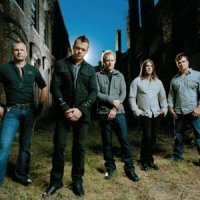 I first saw 3 Doors Down ten years ago at Shepherds Bush Empire, when they used to pop over the Atlantic for one show only. The band is now popular enough to warrant a tour over here and although the number of dates has increased the quality remains the same. The shows are as good as they’ve always been making 3 Doors Down the most consistently brilliant live band that I have seen over that period. Tonight is no exception with the one and a half hour set disappearing in a blur of brilliance. Opening with the title track from the latest album we are treated to heart felt ballads like ‘Here Without You’, and ‘Heaven’ , the melodic genius of ‘When You’re Young’ and ‘Every Time You Go’ alongside the live staples ‘Duck and Run’, ‘Loser’ and ‘Kryptonite’ as a rousing encore. In a performance as near to the original album recordings as you can possibly get it’s hard not to be impressed with 3 Doors Down yet easy to understand their professionalism. They’ve been together for sixteen years-almost unprecedented these days- play at least three hundred concerts a year and grew up with each other at school; in short they know their game and each other’s inside out. With sold out concerts up and down the country it seems that Britain has finely woken up to 3 Doors Down and realised that they are the real deal. The door finally seems to have opened.